Four time recipient of the Pulitzer Prize for Poetry, Robert Frost (1874 - 1963) was, and remains, an icon on the American literary landscape. Though born in San Francisco, he is closely identified with New England and his poems dealing with rural life. We feature Frost in Pulitzer Prize Winners. 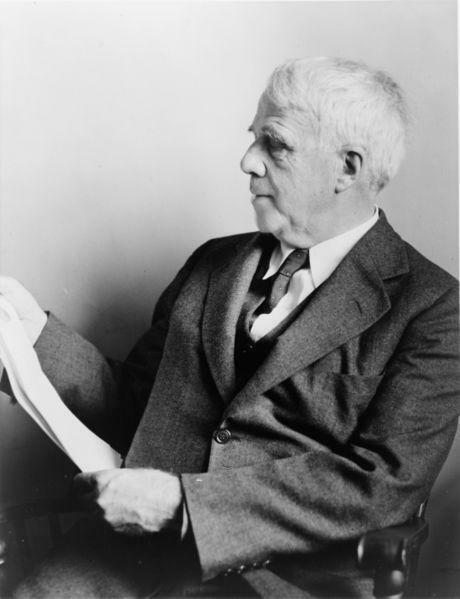 My favorite story about Robert Frost was told by a visiting professor while I was in college. It's a story worth sharing . . . When Frost was 86 years old, he was honored by president-elect John F. Kennedy to read at his Jan 20, 1961 inauguration. Frost was reportedly quite fond of J.F.K. and labored to write a special poem for the event. The words did not come easily. I think we have all been in that situation, where the desperation of desire complicates the task. The chore was made more difficult by the fact that Frost was nearing the end of his life and was no longer at the height of his powers. Still he labored and eventually produced a new poem for Kennedy's inauguration. By sunrise, the snow had ended and the skies were clearing, but the day remained bitter cold ... [D]espite the cold, a large crowd turned out for the swearing-in ceremony and inaugural parade. At noon, the temperature was only 22°F and the wind was blowing from the northwest at 19 mph, making it feel like the temperature was 7°F above zero. When Frost took to the stage, the old man -- blessed with rare sensibility and the wisdom of age -- understood that his poem had come up short. If it were disappointing to him, would it not be disappointing to the President, indeed to all? As he stood at the lectern to read his poem, Dedication, a strong gust of wind came along and the old man purposefully loosened his grip, releasing the newly composed poem to the wind. After which, from memory, he recited the poem recorded in history, The Gift Outright, a poem that was written in the 1930s and published in 1942. I do not know whether this account of events is true or not. I suspect it is not. But who, upon hearing it, would prefer the truth instead?